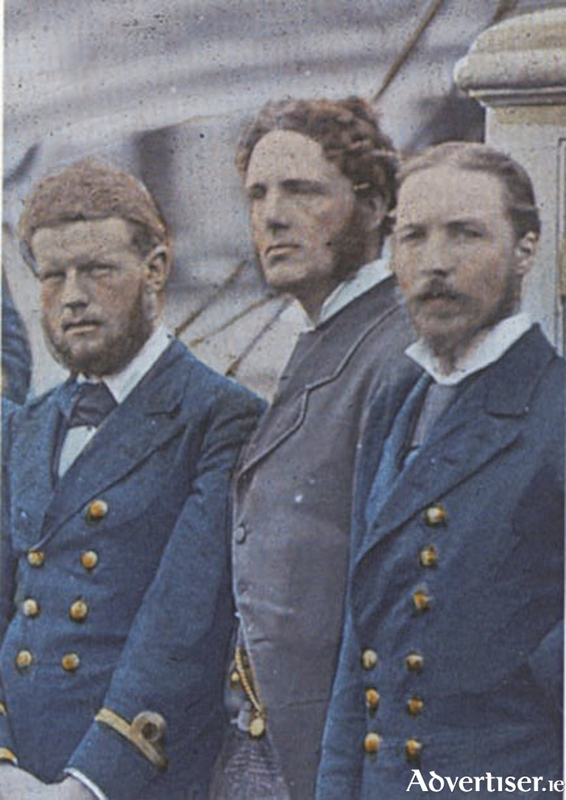 The ‘Grecian profile’ of Henry C Hart (centre) on board the HMS Discovery at the start of the British Arctic expedition 1875 - 1876. Augusta’s mother Frances had made it plain that she preferred boys to girls, a remark that Augusta heard as a child. She did not get on well with her mother, with her strong evangelical Protestant views. She resented being brought into the homes of their tenants as their mother attempted to change their religious affiliations. It was, however, a lively, rough and noisy household, largely based around the boys’ love of hunting and sports, especially when they were home from school. The girls enjoyed their brother’s enthusiasms, but developed close relationships among themselves, under the loving authority of their elderly, and at times dramatic, nurse Mary Sheridan. She kept the girls riveted by her stories of the 1798 rebellion, and the French landing at Killala Bay. Augusta was considered plain. It was more or less agreed that she would never marry, and would serve as a carer within the family. Having grown up in practically a bookless home (except for the Bible which was read aloud every evening, and pocket money doled out depending on the verses learned by heart ), Augusta, at the age of 18 years, was free to read what she liked. She embraced that freedom with enthusiasm and pleasure. One summer her brother Frank, then a medical student at Trinity, brought home a friend, Henry Chichester Hart, on a visit. After dinner when the family sat around in the drawing room, Augusta was surprised when Henry ‘seemed to drift to me rather than my elder sisters.’ Henry had been with her brothers to the races that day. But before they could speak together, Frank came over and motioned to Henry that they leave the room together. The next day Frank told her that Henry apologised for his behaviour, indicating that he had had too much to drink. Augusta protested that she had noticed nothing of the sort. She felt sorry for him. A day or two later she was reading in the garden and Henry approached her. He asked what she was reading. He sat down beside her and they discussed books, both of them totally at ease. They had argued and joked about the origins of a quotation they both admired. But her father, being wheeled through the garden at the time, heard them. He was not pleased. Next day she was ordered to stay with her cousins at Castle Taylor, until their guest had left. Before he left Roxborough he left an envelope of poems for her, which she kept. Years later Augusta learned he had sent her a letter but she never received it. It was opened by her mother and father, and incredibly, by the Archdeacon. All the letter contained, however, was the quotation and its author, over which they had their friendly argument. Augusta wondered which made made her most angry, or amused: the opening of the letter and keeping it secret from her, or laughing at their faces when they must have puzzled at the meaning of the note. Looking back Augusta wrote ‘I am sure that no thought of love or flirtation had crossed my mind’. But her stress on Henry Hart’s ‘Grecian profile’ and her careful accounting of meeting him fleetingly, and hearing about him in later life, perhaps tells us a different story. NOTES: *Augusta was the ninth of 13 children (eight boys and five girls ) of Dudley Persse, and his second wife Frances, nee Barry. Her father had a son and two daughters by his first marriage. ** Seventy years 1852 - 1922, published 1976. *** In 1875 Henry C Hart accompanied Sir George Strong Nares as a naturalist on his British Arctic expedition. Hart was also a Shakespearian scholar, but is perhaps best known today for initiating Hart’s Walk. In 1886 he wagered with the naturalist RM Barrington that he could walk from the tram terminus in Terenure in Dublin to the summit of Lugnaquilla in the Wicklow mountains, a total of 75 miles, and back in 24 hours. He left Terenure at 10.58 pm on June 20 1886, and arrived back at 10.48 the next evening. For this week’s Diary I am leaning on Lady Gregory’s Early Irish Writings 1883 - 1893 by James Pethica, recently published by Colin Smythe.